How was your weekend? We moved into our new place and I’m freaking exhausted. This girl is in need of a mini vacation. Just the other week I recieved Angela’s new cookbook Oh She Glows Every Day. If you’re not familiar with the blog Oh She Glows, now’s the time! 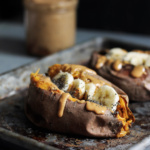 Oh She Glows is a vegan blog, focusing on healthy every day plant-based approachable recipes. They’re consistently delicious and beautiful. Angela asked if I was interested in sharing a recipe with you guys in preparation for her new cookbook launch. After receiving the cookbook in the mail, I spent some time flipping through recipes, trying to decide on what to make you all. I landed on Angela’s unique take on a warm potato salad: Roasted Garlic Basil Pesto Potatoes with Arugula. It didn’t take me long to whip up these potatoes. 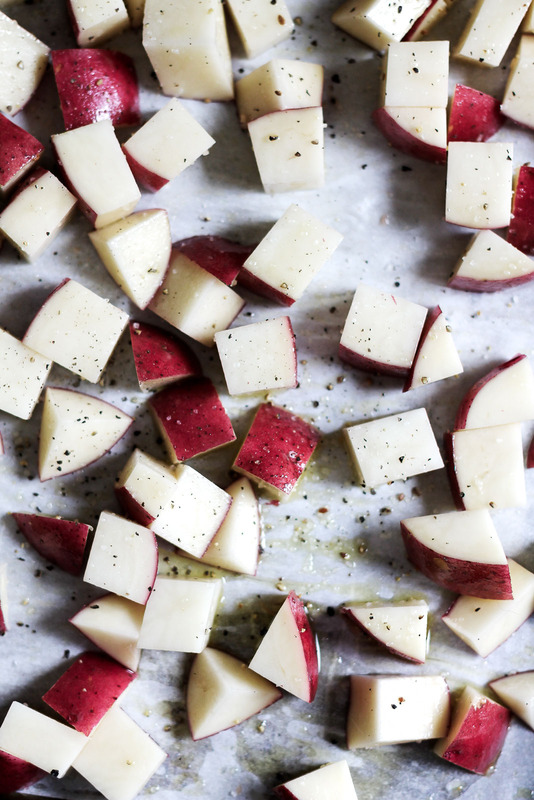 I chose red potatoes because I’m a huge fan of their flavor and how the skins get crispy when baked in the oven with a little heart-healthy olive oil. After the potatoes are roasted, they’re tossed with zippy arugula and a simple homemade pesto that’s lick-the-bowl good. 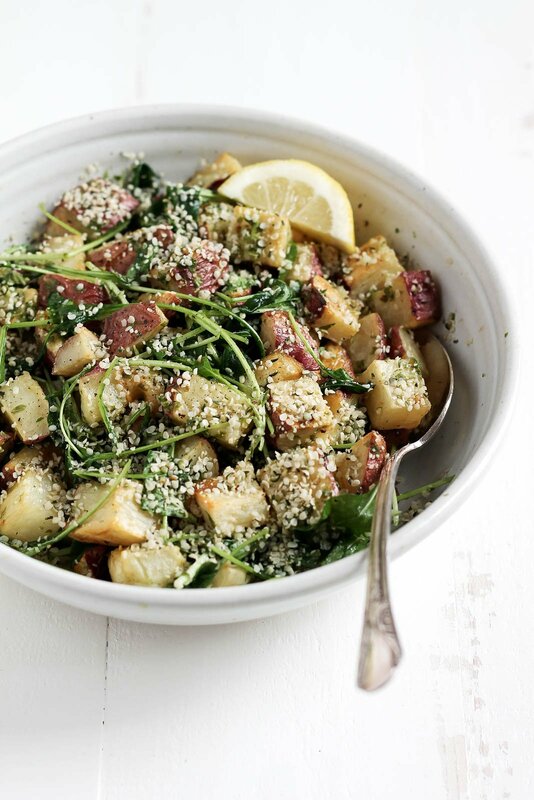 To finish it off, the potatoes are topped with hemp hearts, which give the salad a boost of omega-3 and fiber. SO dang good. I served the potatoes with these basil chicken burger patties one evening (because I’m not vegan) and enjoyed them for lunch on their own another day with scrambled eggs. I’m thinking these potatoes would be perfect for meal prep for the week or as a gorgeous side dish during the holidays. Obviously you need to make these potatoes ASAP, but don’t forget to pick up a copy of the Oh She Glows Every Day cookbook! 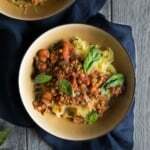 It’s really one of my favorites because of how simple (but delicious) the plant-based recipes are. Eating a plant based diet isn’t as complicated as it seems — so if you’re looking for a great resource, then this cookbook is for you! Have a happy, healthy Monday! 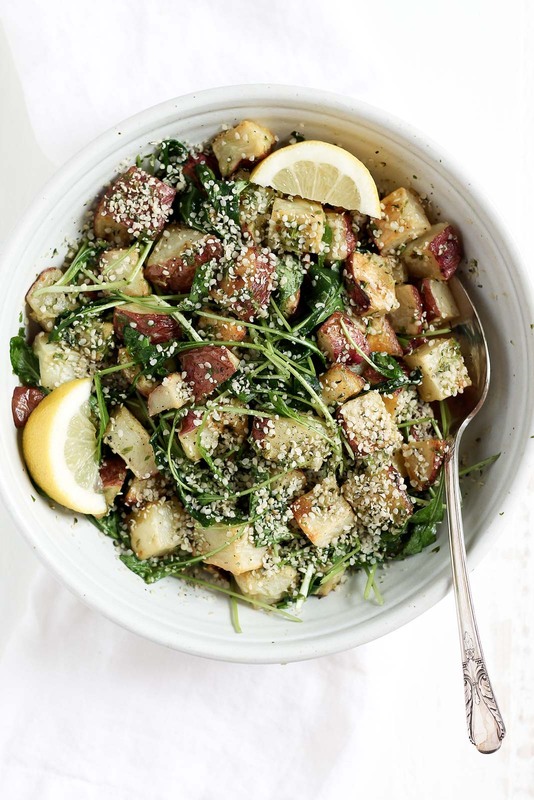 A new potato salad to try: Roasted Garlic Basil Pesto Potatoes with Arugula from the Oh She Glows Every Day cookbook. 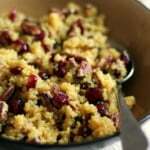 Delicious, satisfying and a wonderful side dish! Preheat the oven to 400°F (200°C). Line an extra-large baking sheet (15 by 21 inches/38 by 53 cm) with parchment paper. Place the potatoes on the baking sheet and toss with the olive oil until thoroughly coated. Spread the potatoes into an even layer. Season with a couple of pinches of salt and pepper. Slice the top off the garlic bulb so all the individual garlic cloves are trimmed. Place garlic bulb on a square of aluminum foil (about 8 inches/20 cm square) and drizzle the top of the cloves with the olive oil. Wrap the garlic bulb entirely in the foil and place it on the baking sheet with the potatoes. In a food processor, combine the pesto ingredients and process until mostly smooth, stopping to scrape down the bowl as necessary. Keep the pesto in the processor because we will add the roasted garlic as the final step. Remove the potatoes and garlic from the oven. Carefully unwrap the garlic bulb and let cool for 5 to 10 minutes, until it’s cool enough to handle. Turn off the oven and return the potatoes to the oven with the door ajar so they stay warm. (You can also put the potatoes into an oven-safe casserole dish so the dish stays warm when serving.) Squeeze the roasted garlic cloves out of the bulb. You should have about 2 packed tablespoons (30 mL) of roasted garlic. Add it into the food processor with the pesto. Process until mostly smooth—you can add a touch more oil if necessary to get it going. 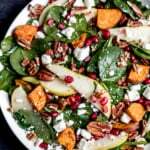 This is the important part where you need to act fast; I like to assemble the salad very quickly so that it’s warm when I serve it. 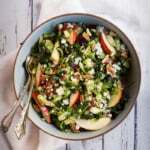 Grab a large serving bowl and place the arugula in the bottom of the bowl. You can break it up into smaller pieces with your hands a bit. Then, remove the potatoes from the oven and quickly place them into the serving bowl on top of the arugula. Toss the potatoes and arugula with the pesto until thoroughly combined. Taste and season with salt and pepper. Sometimes I add another drizzle of lemon juice if I feel like the dish needs more acidity. Sprinkle on the hemp hearts and serve immediately. If you want to make this recipe easier, I would advise just mincing the garlic and tossing it with the potatoes before roasting in the oven. For the pesto, I'm a fan of reducing the olive oil in this recipe by a tablespoon or two and replacing it with water. You shouldn't notice a big difference. Reprinted from Oh She Glows Every Day by arrangement with Avery Books, a member of Penguin Group (USA) LLC, A Penguin Random House Company. Copyright © 2016, Glo Bakery Corporation. 25 Responses to "Roasted Garlic Basil Pesto Potatoes with Arugula from Oh She Glows Every Day"
Hi! I have her new cookbook and love it too! I spent last Sunday making 4 different things from her new book, all of which are amazing. With your PB obsession, you should really try the Peanut Better Balls. Serious yumminess. Both you and Angela are my favourite food bloggers in the WHOLE.WIDE.WORLD!!!!! One can never have too many potato recipes. This looks like it would be a hit with my family! ooh yes!! roasted garlic and pesto are always good things, and the addition of arugula sounds like a great way to add some freshness. I almost thought that these were Japanese sweet potatoes, hahaha! Still looks DELICIOUS. And Angela of Oh She Glows is amazing! Whoa!! 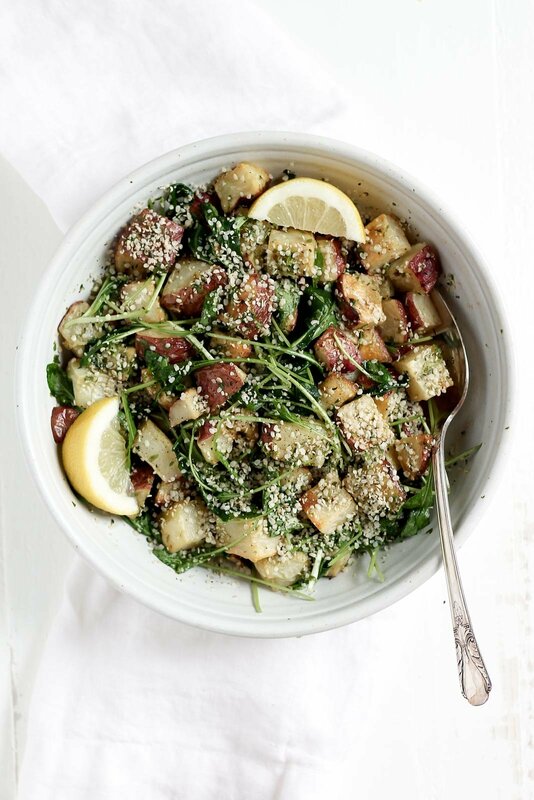 Roasted potatoes in the form of a salad… Now thats my kind of salad!! This is delish!! Monique I absolutely love your recipes, they are 110% up my ally!! 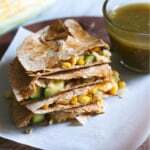 I turn to your website nearly every day for some yummy breakfast, lunch, dinner or desert recipe. They are all amazing (those without meat at least because I am a vegetarian (do eat fish however)). I have turned lots of others on to your wonderful recipes. Thank you so much; keep up this great work!! 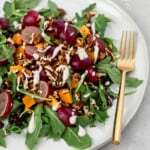 I found this looking for something to use up extra arugula, and this is delicious! A big hit with my family. Awesome! I’m so glad they enjoyed it – such a great, simple recipe. They come from hemp seeds – high in omega-3’s and healthy fats! Here’s a brand that I like. What can you substitue hemp seeds with? pine nuts?